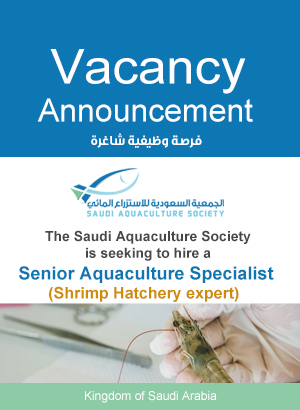 Since the start of aquaculture industry in the Kingdom of Saudi Arabia at the beginning of the eighties of the last century, the government undertook the necessary measures to establish the aquaculture industry as one of the important productive sectors by establishing a specialized aquaculture research center in Jeddah. One of the major concerns of this center was to investigate the commercial species, whether marine or freshwater fishes of shrimps, which are most suitable for aquaculture in the local environment of the Kingdom.Since that time, the diversity of cultured species changed with the changing conditions and farming systems, as well as the choices of investors. Below is a review of the most prominent aquatic species which had been cultured, including those produced commercially, and others which are still in the stage of research and study, the production size and their importance to the aquaculture sector in the Kingdom. For a long period of time, the Indian white shrimp Fenneropenaeus indicus formed the most important farmed species in the Kingdom of Saudi Arabia since studies began on its culture at the Fisheries Research Center in Jeddah in the mid-eighties until the start of its commercial culture in 1997 by establishing the first large commercial farm for its farming. With the foundation of the National Prawn Company (presently, National aquaculture Company) in 2000, the production size of this species increased progressively to reach its peak in 2009, with an estimated total annual production of about 20, 000 metric tonnes from 5 farms, which placed the Kingdom of Saudi Arabia as the world largest producer of the Indian white shrimp, and the National Prawn Company in Lith, as the largest global producer of shrimp. Litopenaeus vannamei was introduced into the Kingdom of Saudi Arabia in 2012 as part of the activities undertaken by the Saudi Aquacultural Society in cooperation with the Ministry of Agriculture, and as one of the important measures taken to maintain the sustainability and continuity of the aquaculture projects in the Kingdom, which were seriously hit by the White Spot Syndrome Virus (WSSV) at that time. P. vannamei is well known to be resistant to WSSV, and is considered one of the most widespread shrimp species in the world. The Asian Seabass (Lates calcarifer) is the most commonly cultured fish species in the Kingdom, and its culture has recently been expanded significantly in the Kingdom. It is characterized by several cultural properties, such as rapid growth, ease of breeding and suitability to the climatic conditions of the Kingdom. Although its culture trials started at the Fisheries Research Center in Jeddah in 1998, yet and commercial production started in 2006. The period starting from 2011 onwards witnessed a rapid growth in the culture of this species as it has been farmed in a number of culture systems, including tanks, earthen ponds and floating cages, with production reaching 5,000 MT in 2014. Generally, the culture of this species is common in marine and freshwater farms in the Kingdom. Gilthead seabream (Sparus aurata) is a marine species which had been successful cultured in the northern regions of the Red Sea, where the temperature usually drops. It is widespread throughout the Mediterranean basin and finds wide acceptance in the European countries. This fish was introduced into the Kingdom in 2008, and commercial productions operations started in one of the large farms by using floating cages. Presently, this fish is produced in cages in three farms and production has exceeded 2,000 MT in 2013. Sobaity seabream (Sparidentex hasta) is a fish that is widely spread in the Arabian Gulf region, and was cultured in some of the Gulf States for a considerable period of time. Recently, it has been cultured on a commercial scale in the Kingdom in one of the floating cage farms in the northern Red Sea. However, the volume of production is still limited. Despite the importance of the grouper species and their high economic value locally, yet their scope of culture is still limited to research and rearing trials in some farms. Several species of groupers have been studied in the Fisheries Research Center in Jeddah, including Epinephelus coioides, E. malabaricus, E. Fuscoguttatus and E. polyphekadion. Moreover, the FRC conducted extensive culture trials on some species of high market value, locally and globally, such as Najil (Plectropomus pessuliferuss) and Taradi (P. aerolatus). The farming of rabbit fish (Siganus rivulatus) has been investigated extensively in the Kingdom, as this species enjoys wide acceptance by the consumer in the local market. It is considered one of the traditional fish in the Red Sea. 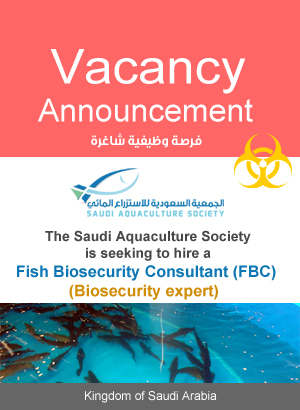 The Fish Farming Center in Jeddah (presently, Fisheries Research Center in Jeddah) had early carried out studies on the cultivation of this species. However, the scope of its farming is still limited to the previous trials only. One of the farms usually collects fingerlings of rabbit fish from the sea and rear them in cages and enclosures. Marine tilapia (Oreochromis spilurus) is one of the oldest fish species which had been introduced into the Kingdom in the early eighties of the last century, even before the establishment of the Fish Farming Center in Jeddah. This species was chosen because of the ease of its farming, economic viability and flexibility of its farming in marine, freshwater and brackish water. Its culture is still limited to the research centers and some inland brackish water farms. Grey mullets are among the traditional fishes in the Kingdom. They are easily cultured in marine and freshwater with low cost of production. Despite this fact, they are not targeted among farmers due to their low prices. They are cultivated to a limited extent in some farms, and their fingerlings are collected from the sea. In addition to the previous fishes, there are other species which have been cultured on an experimental and research scale, and have not yet reached the stage of commercial production; these include the great amberjack, (Seriola dumerili), which has high economic value globally. Also, some of the farms on the Red Sea coast collect Milk fish (Chanos chanos) fingerlings and rear them in some channels and sedimentation ponds. The farming of the Sturgeon (Acipenser ruthenus) is considered one of the most important achievements of the aquaculture sector in view of the rearing requirements needed by this species of fish. One of the successful projects in the eastern region of the Kingdom produces Caviar eggs from a farm by using a closed system of production, with a production capacity exceeding six metric tonnes per year. The Nile tilapia (Oreochromis niloticus) is the most commonly cultured freshwater fish species in inland aquacultural projects in the Kingdom. It is considered the first fish species to be introduced into the Kingdom’s aquaculture sector since its establishment, with a total production of about 4,000 MT per year, produced by small and medium-sized farms distributed over different areas in the Kingdom of Saudi Arabia. The African catfish (Clarias gariepinus) is the only catfish species which had been introduced lately into the freshwater aquaculture sector in the Kingdom of Saudi Arabia. Its overall production is limited, and exceeded 50 MT only recently. The culture of ornamental fish has witnessed significant growth in the Kingdom following the success of one of the distinctive projects in producing and marketing these fishes both locally and abroad. More than 60 fish species were cultured, including Molly, Gold fish, Sword Tail, Fighter, Koicarp, Black Ghos, Barb, Rainbow Fish , Shark, Platy, and several other species. This success has encouraged other small freshwater farms to culture some species of ornamental fish on a small scale in different areas. Sea cucumber (Holothuria Scabra) is one of the recent species which had been cultured in the Kingdom. In 2013, a major national company working in the field of aquaculture announced the establishment of a new project aimed at producing 90 MT of sea cucumber annually. In the same year, more than 23 million larvae of sea cucumber were produced locally for the first time. This project is considered one of the pilot projects in the Kingdom due to the economical and environmental importance gained by sea cucumber. Marine algae cultured in the Kingdom vary according to the activity in which they are used. There are some species of unicellular algae which are cultured locally since the start of production of shrimp and some marine fishes, due to the close relationship between these algae with the feeding of the early stages of the life history of shrimp and fish. However, since 2010 there was a major trend to support the aquaculture sector in the Kingdom and start the commercial production of algae to benefit from the relative advantage provided by the climatic conditions favorable for their growth in the Kingdom. There are several species of micro-algae which are continually produced in the fish and shrimp hatcheries and research centers. These algae which are usually fed to the larvae during the early stages of their growth include, Tetraselmis, Chlorella, Nannochloropsis, Cheatoceros, and Skletonema. Other micro-algae are produced on a commercial scale. In 2014, the first unique project which produces the algae (Dunaliella salina) was established. The cultivation of macro-algae received much interest only recently due to the need to utilize these algae in many important usages, such as their use in operating specialized aquaculture systems such as aquaponics, or their use as raw materials in some important industries like fish feeds. Investigations are underway on two species of economically important macro- algae present in the Red Sea natural environment. These are Ulva lactuca and Gracilaria arcuata.